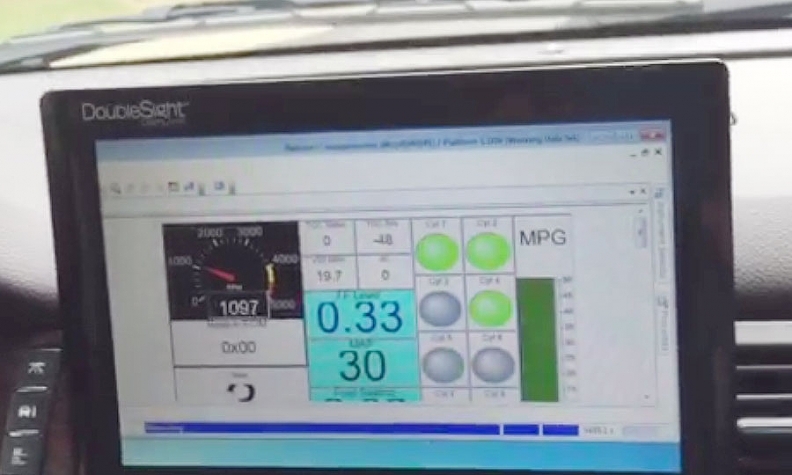 A monitor shows the status -- active or deactivated -- of cylinders in the Dynamic Skip Fire system under development by Delphi, General Motors and Silicon Valley software startup Tula Technology. DETROIT -- An advanced, fast-acting cylinder deactivation system expected to be launched within five years -- probably by General Motors -- could revolutionize gasoline internal combustion engines by firing only the number of cylinders needed. Dynamic Skip Fire, or DSF, enables a V-8-powered SUV, such as a GMC Yukon Denali, to cruise smoothly and steadily at highway speeds with the engine firing on as few as two cylinders. That could boost fuel economy by as much as 21 percent and reduce emissions by nearly the same amount. The technology is being developed by Silicon Valley software startup Tula Technology Inc., which created the algorithm, and General Motors and Delphi Automotive, which have invested in the company and are working with Tula to bring the system to market. The first vehicles with Dynamic Skip Fire could be on the road by 2020, said Jeff Owens, Delphi’s chief technology officer. Delphi and Tula officials gave reporters a sneak peek at DSF last week in Detroit and plan to showcase the system this week at the Frankfurt auto show. GM in January announced it was investing in Tula and appears to be first in line to use DSF. Today’s cylinder cutoff systems typically shut down half the cylinders on a V-8 or two or three cylinders on a V-6. But DSF is active on all cylinders and it continuously varies those that fire. The strategy enables the engine to maintain proper operating temperature and production levels of smoothness, Tula CEO Scott Bailey said. Another key difference between today’s cylinder cutoff systems and DSF is how the engine’s throttle system is managed. Gasoline engines use a flap in the throttle body to regulate the amount of air that enters the intake manifold. The flap’s usual position is nearly closed, causing the engine to work harder to ingest air. DSF keeps the throttle flap almost fully open and controls the engine’s power by varying the numbers of cylinders that fire. “The more power you need out of your engine, the more torque, the harder you press down on the accelerator pedal, the greater percentage of your cylinders will fire. This is software-enabled variable displacement,” said Bailey. A V-8-powered SUV requires only about 30 hp to cruise steadily at highway speeds, Bailey said. In that scenario, DSF shuts down six of the cylinders on a V-8 engine. Using the EPA’s testing guidelines, Tula tested a full-size V-8-powered SUV and registered fuel economy gains of as much as 21 percent, Bailey said. Near Detroit last week, engineers demonstrated the system on a GMC Yukon Denali powered by a 6.2-liter V-8. At idle, and when accelerating, the hulking SUV ran normally, using all eight cylinders. But once the driver’s foot eased up on the throttle, the number of cylinders firing began to drop. At a steady 65 mph, only two cylinders were active, but there was no excess noise or vibration, and when power was needed, the other six cylinders were activated immediately with no lag or other side effects. Owens says DSF works on all types and sizes of gasoline engines, overhead-cam or pushrod, in any configuration, V or inline, and can be installed on engines with four cylinders or more. DSF uses much of the cylinder deactivation hardware already developed. On GM engines with the company’s active fuel management system, for example, the cylinders are shut off by stopping the flow of oil to certain valve lifters. On a V-8 engine with 16 valves, only eight valves have the special lifters that enable the cylinders to be cut off. On a DSF-equipped engine, all 16 valves need the special valve lifters. “There’s a little more complexity in the engine-control software,” said Bailey. Depending on the size of the engine, an automaker’s cost to install DSF would range between $300 and $600 per engine, according to estimates provided by Tula and Delphi that use information from the National Research Council.